I can't believe that we are just a few short weeks away from Christmas! With the holiday season in full swing I have been super busy shopping for gifts, decorating the house, and, of course, baking! 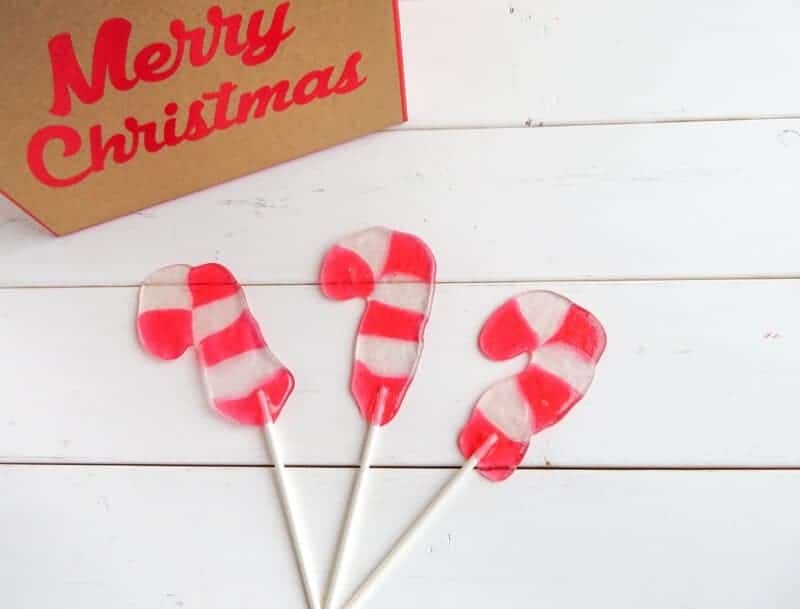 Since the Turkey Suckers I shared for Thanksgiving and the Frankenstein Suckers I shared for Halloween where such a huge hit, I know you guys will love these adorable Candy Cane Suckers! These little cuties will make the perfect treat for your holiday party! Check out the simple step-by-step directions below to make these cuties yourself. Unwrap the Jolly Ranchers and cut each in half. I used a Clever Cutter but kitchen scissors work just as well. Next, on a parchment lined cookie sheet, place Jolly Ranchers in alternating colors in a candy cane shape. Make sure thatthe Jolly Ranchers are touching each other. Leave enough space between each candy cane so that when they come out of the oven you can put a sucker stick in them. Once you have all your Jolly Ranchers in place pop them into the oven until the Jolly Ranchers melt together (should take around 4-5 minutes). After removing from the oven immediately roll the end of a lollipop stick in the bottom of each sucker. Then, let them set at room temperature until they harden (about 10 minutes). Now, they are ready to serve! I hope you enjoyed this easy-to-make and super cute Candy Cane Sucker recipe. If you are looking for more easy and delicious Christmas treats you might want to take a peek at these adorable Santa Hat cupcakes or these cute Sugar Cookie Pudding Cups. Next, on a parchment lined cookie sheet, place Jolly Ranchers in alternating colors in a candy cane shape. Make sure the Jolly Ranchers are touching. Leave enough space so when they come out of the oven you can put a sucker stick in them. Pop them into the oven until the Jolly Ranchers melt together (should take around 4-5 minutes). Immediately roll the end of a lollipop stick in the bottom of each sucker. Let them set at room temperature until they harden (about 10 minutes). These are so cute and only one ingredient! I never thought to melt jolly ranchers. Great idea. These are so easy to make I’m going to let my grandaughter make them.Thanks for the recipe. Super simple and cute! I bet they taste good too! These are so cute! Genius too, since they are Jolly Rancher–you know they taste good! In my opinion, Jolly Ranchers are some of the tastiest hard candy around! I pinned this easy Christmas treat! My 15 grandkids will love them! YUM! What an amazing idea. Would love to do these for gifts. This is the coolest idea I have seen done with Jolly Ranchers!! It seems like a simple enough to make. I never would’ve thought to melt jolly ranchers! I’ve never seen this recipe before its genius, going to try it before the family get together this weekend! wow easy, cute, and genius! loving this so much! They look so good and easy to make. I love Jolly Ranchers. These are too cute & I’ve never seen another recipe like it!